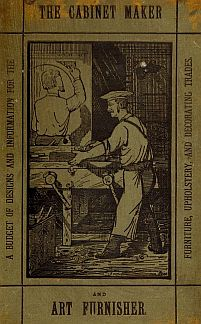 Cabinet Maker and Art Furnisher was published monthly and edited by J. William Benn. It was the leading journal for the furniture and furnishing trade in Britain in the late Victorian period and is one of one of the principal sources for research on design and manufacture in this sector during these years. The focus of the journal is very much on design. It is extensively illustrated and contains numerous articles. It also includes reports on current trends, a round up of trade news, reviews of trade literature, details of new patents, etc. By 1890 Cabinet Maker and Art Furnisher incorporated a number of other trade publications including The Upholstery & Decorating Journal; Carpet & Floor-Covering Record; Furnishing Hardware Guide, and Timber-Yard & Woodworking Machinist.